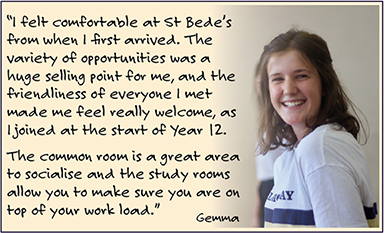 St Bede's has one of the largest and most successful sixth forms in the county, offering a wide variety of courses. 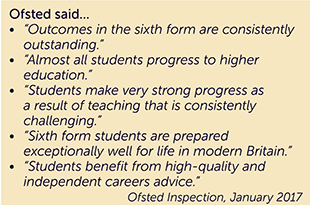 In January 2017, as part of our Ofsted inspection, our work with 16-19 year olds was rated 'Outstanding'. providing a sixth form education that will help you flourish academically, socially and personally. The secret of our success is having a group of outstanding teachers who build on the knowledge of all our students as individuals, and who are committed to excellence. Our team of expert tutors are keen to prepare you for the next stage of your education, which usually means university entrance. The whole university application (UCAS) process can be traumatic, and we will guide you through it step by step, so you have the best possible chance of achieving your goal. If you are one of our many students aiming for a top university, we offer a devoted programme of visits and extra classes, together with activities such as Duke of Edinburgh Gold Award and exclusive preparation for Oxbridge candidates. We are confident that these will give you the best possible chances of success. For us to work together to achieve all your goals, we ask that you attend regularly and take responsibility for developing your skills and talents with determination. Throughout your studies, we are dedicated to tracking your progress and promise to inform you and your parents on how well you are doing. There is also an outstanding selection of enrichment activities available to you, designed to enhance your life outside of the classroom. Whatever your talents and interests, St Bede’s will have something for you. With RAG week (raising nearly £12,000 in March 2018), an active student council, music groups, sporting opportunities and a more adult relationship with your teachers, St Bede’s really does feel different in the sixth form - the standards here are hard to beat. Who joins our Sixth Form? The great majority of our own students from Year 11 continue to study with us in the sixth form, where they are joined by students from all local schools (and some further away). 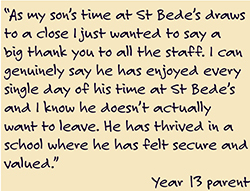 Any student who is qualified for the courses we offer is welcome to be a sixth former at St Bede's. We do expect that you will play your part within this inclusive and friendly Christian community - but we respect and value everyone's own journey in faith and understanding - you certainly do not need to be a Christian or a church-goer to be a full member of our community. Our document below 'Celebrating St Bede's Sixth Form 2017-18' will give you an overview of what our sixth formers have done and achieved during the course of the last academic year. Please also see the 'Sixth form update summer 2018' for more information. Click on this link to follow us on Facebook.